Ghana is slipping on the muddy banks of a bust gold mine, eating up its future for a quick gain. Ghana is the second-largest producer of gold in Africa. The mining industry has been a key contributor to its rapid economic growth to become a middle-income country. However, this growth has had enormous human and environmental consequences, and the local communities impacted by this are not compensated properly. Since gold in Ghana often lies mixed with soil just below ground, miners scoop out wide swaths of land. The worst offenders, including entirely illegal operations, ruin the land and leave the mine as a gaping hole in the ground. This abandoned hole, perhaps once the site of a village or grove of cocoa, can be a constant reminder of lost opportunity. Working with IBIS one weekend in 2014, Mikaela Saletti, Nick Radovic, and I developed ways of reintroducing opportunity. Our first concept acted on IBIS’ aim to make political changes via public engagement. By leveraging quantitative data gathered by the public, Ghanaians could influence politicians to change unjust laws and ensure that existing laws are properly and consistently implemented. The data could, for example, be documented violations and injustices, which would be sent to district officials and mining companies in order to ensure proper compensation for the local communities. Crowdmap is a reporting platform by the Ushahidi project and suits these technical requirements quite well. We used it to set up Mine Watch: a means of documenting injustices suffered by irresponsible mining. 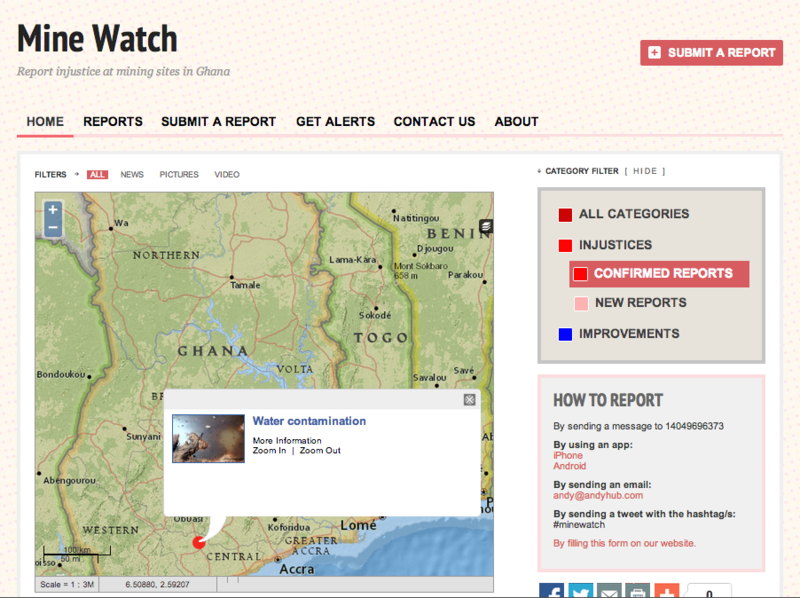 Mine Watch allows anyone to submit reports via the website, SMS, mobile apps, email, and Twitter. Each report can include a description, location, photos, and other useful information and be verified and substantiated by trained mine watchers. It also exposes this data via public APIs, allowing developers to build more artifacts, further publicizing these violations. With this data open, we considered what would be needed to make these additional works actually happen. 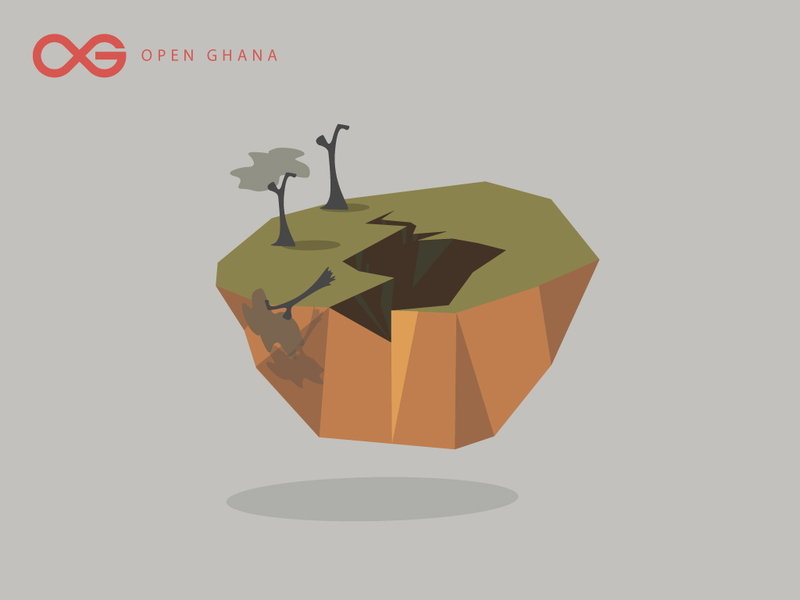 So we conceived Open Ghana: a platform for sharing ideas and solutions to these injustices, like a perpetual hackathon. By inviting creatives to donate their brain at any time, generating highly shareable creative material, we can generate international interest in Ghana and hit the critical mass needed for a crowdsourced platform. Of course, the bulldozers won’t stop just for our designs and ideas. It’ll be the volume. We’ll bring the noise to a country that needs it to make the politicians listen. To make sure they know that Ghana’s future is ecological bankruptcy in the guise of a gold mine. Let’s keep going, we’ll keep the doors open to anyone who wants to invest. 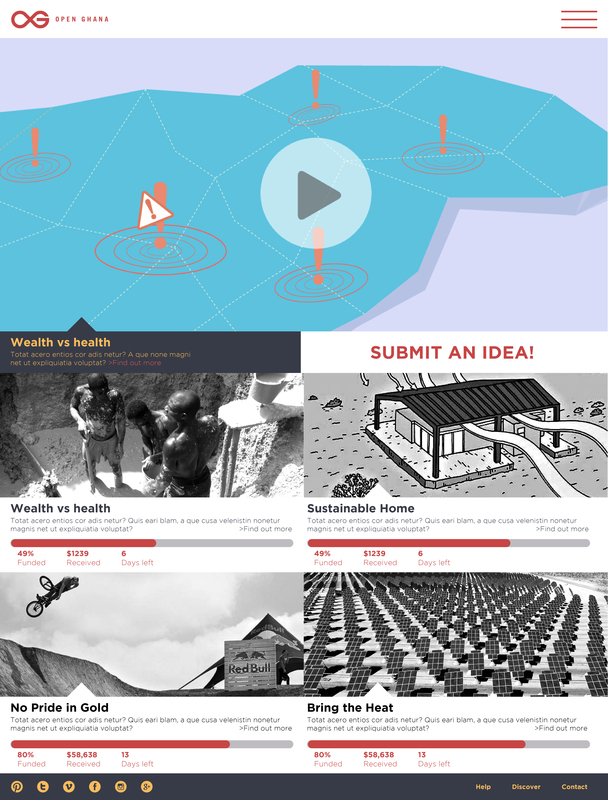 Be they any of you or big companies like Red Bull, we will open Ghana to crowdsourced investment, data, and ideas. The next step would be making these ideas happen. With the help of IBIS, we could take our Open Ghana project, along with the brainpower donated at IDEAID, to Ghana’s own universities, engineers, and citizens and provide them with the resources they need to regain their footing on a currently unsustainable economy. We can help Ghana reclaim its lands of opportunity. The representative image used for this page was created by Mikaela and Nick, two awesome designers from Sweden’s Hyper Island.